When Spartan Mowers first roared onto the scene in 2015, they were seeking to bring more power and, yes, even fun, to the mowing experience. They’ve fast become objects of envy for property owners across the USA in the years since, and there are many reasons why. 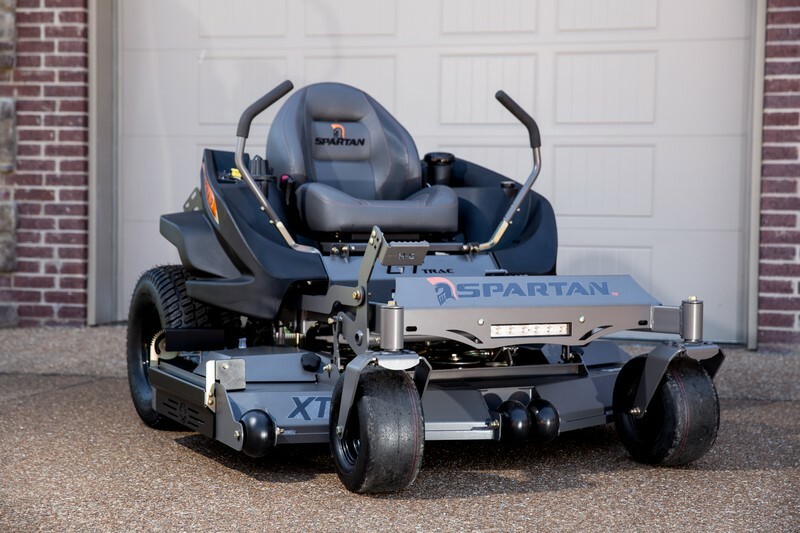 Not already dreaming of owning a Spartan zero turn mower? We’re here to convince you. Spartan Mowers are built right here in America to provide you with a smoother, more powerful riding experience when mowing. The awesome engine power and aggressive styling of Spartan’s zero turn mowers set them apart, offering commercial grade capability for home mowing. Driving a Spartan mower feels much like piloting a sports car, and when it comes to durability and performance, these zero turn mowers are second to none. Let’s take a closer look at some of the fantastic benefits that Spartan mowers bring to the yard. The basic zero turn design of all Spartan models enables you to move in all directions (left, right, forward and backward) effortlessly. This maneuverability means that you can quickly and smoothly navigate common obstacles in your lawn such as trees, stumps, and flowerbeds. It also allows you to mow much closer to the lawn’s edge, reducing the time spent in separately trimming and edging walks, patios, and driveways. A primary reason to choose a Spartan zero turn mower is the comfortable driving experience. Steering is lever-based on all models, which removes the stress on your back and shoulders associated with conventional steering wheel navigation. An ergonomically designed cockpit and comfortable seats featuring elastomer bumpers (with dampeners on RT and SRT models) mean mowing isn’t a physically demanding task any longer. Spartan’s premium SRT series mowers further elevate comfort with Smart Ride Technology that absorbs all jostling and shock to ensure the most comfortable mowing experience possible. Some points of Smart Ride Technology include TeksPak elastomer dampeners in the seat middle and back, as well as front neoprene cushioning; a 360° floating seat system, which is adjustable for operator height; and a frame design with unique neoprene torsion bar. You can even upgrade your comfort by choosing custom-built seats on the SRT mowers! When it comes to quick cutting time, Spartan’s zero turn mowers have few equals, which means reduced fuel usage. With a Spartan, you’ll spend less time mowing and less time filling up the tank, too. Spartan zero turn mowers are faster and more efficient than comparable models from other manufacturers, making these speedsters ideal for individuals who need to mow several acres at a time on a regular basis. So, how fast can you mow with Spartan zero turn mowers? Typically, you can expect to reduce average mowing time by half! That can add up to more time spent enjoying your outdoor spaces instead of just mowing. Specifically designed to provide a faster and more even cut, Spartan zero turn mowers are ideal for commercial lawn care businesses with full client rosters, which means they can easily handle your residential property, no matter its size. As we’ve already touched on, Spartan Mowers are available in several different models that offer a variety of features and power options to meet your lawn’s particular needs. Starting with the economical RZ series that performs at commercial grade for a budget-friendly price, we’ll break down the three different series in the Spartan lineup. So, why choose a Spartan Mower over the rest? Ranking among the most aggressive and powerful zero turn mowers on the market today, Spartan Mowers feature a simplistic design optimized for precise cutting, smooth riding, easy maintenance, and long-lasting durability. And, they’re made in the USA for the unique challenges of American lawncare. Customize your very own Spartan mower by getting in touch with us today! PowerPro Equipment is the only Spartan Mowers dealer in Pennsylvania.